Illuminate Ausin is a revival of a 22-year SafePlace tradition of hosting community walks. The walk raises essential funds for SafePlace programs, but it also delivers a message: that help is available to the thousands of homes in our city where violence and fear still prevail. Last year over 1,000 Austin residents came out for the first ever Illuminate Austin, but this year's walk promises to be even bigger and better. 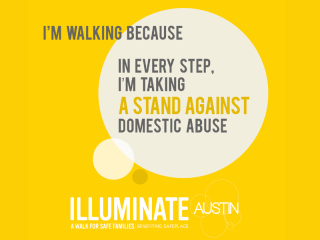 Please join as SafePlace welcomes Austin community leaders, survivors, teams, moms, dads, kids and dogs to the 2nd Annual Illuminate Austin.